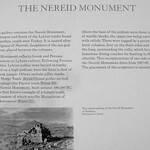 The Nereid Monument is a sculptured tomb from Xanthos in classical period Lycia, close to present-day Fethiye in Mugla Province, Turkey. It took the form of a Greek temple on top of a base decorated with sculpted friezes, and is thought to have been built in the early fourth century BCE as a tomb for Arbinas (Lycian: Erbbina, or Erbinna), the Xanthian dynast who ruled western Lycia. The tomb is thought to have stood until the Byzantine era before falling into ruin. The ruins were rediscovered by British traveller Charles Fellows in the early 1840s. Fellows had them shipped to the British Museum: there some of them have been reconstructed to show what the East façade of the monument would have looked like.